The foundation that Burkard Bovensiepen laid in the 1960s in the form of a performance-enhanced BMW 1500, has since developed into a permanent fixture in the luxury sports car segment. What were then the first technologically and qualitatively relevant products marketed by ALPINA, namely four-cylinder petrol engines with Weber dual carburettors, are now in modern form high-tech automobiles. Equipped from the outset with the best possible genes by BMW, they currently represent the ultimate in performance, comfort, driving culture and efficiency. 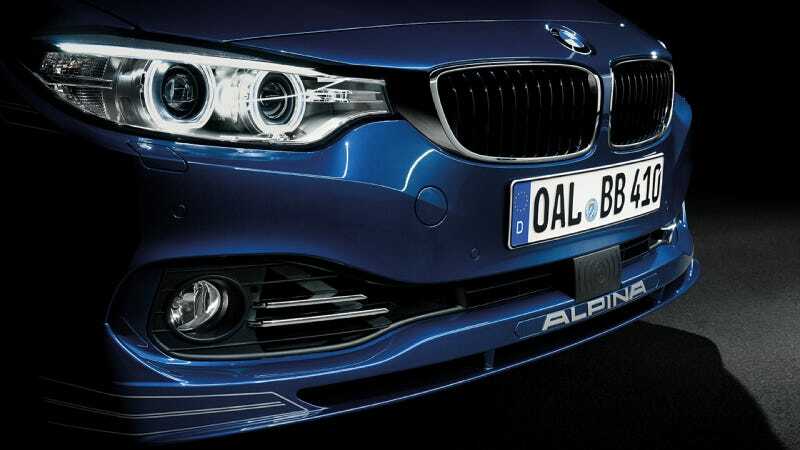 The new BMW ALPINA B3 and B4 Bi-Turbo models combine these characteristics like no other. The modern straight-six 3 litre engine equipped with two turbochargers produces 410hp and a maximum torque of 600Nm. The adaptive ALPINA sport suspension and the 8-Speed Sport-Automatic transmission with ALPINA SWITCH-TRONIC deliver maximum comfort and impressive dynamics. Functional aerodynamics, signature 20" ALPINA CLASSIC wheels and two elliptical double tailpipes are hallmarks of the ALPINA design philosophy. The perfect interaction of power, torque and high-tech transmission means accelerating from 0 to 100km/h (0 - 62mph) takes just 4.2 seconds and a staggering top speed in excess of 300km/h is possible. At the same time these qualities encourage relaxed cruising and stress-free long distance journeys – during which the real life consumption easily drops below 10l per 100km. In fact the new B4 Bi-Turbo Coupé achieves a class-leading combined fuel economy of just 7.6l/100km and 177g/km CO2*. * Preliminary data BMW ALPINA B4 Bi-Turbo Coupé (RWD).